Well that is enough of diversions, time to get back to building divisions. Below is a nice aerial view of the 3rd division in the 6th corps of the French Army of Portugal. In May of 1811, division Ferey had a little over 4000 men. 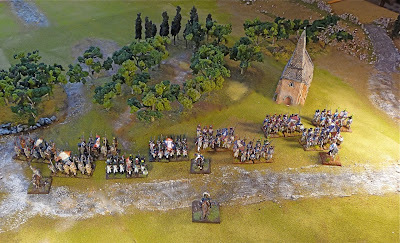 Pictured below are 107 figures in 1o battalions with 4 mounted officers, 3 colonels and the géneral de division. This is a little under a 40:1 man/figure ratio, but battalions of less then 4 bases are really not amenable to wargaming. Général de Division Claude-François Ferey was promoted in 1810. He entered the military in 1787 as a cavalryman in the Chasseurs à Cheval. He was killed in July of 1812 at the Battle of Salamanca. Behind him are 2 régiments étrangers; la légion hanoverienne et la légion du midi. La légion hanovrienne (433 men) is to the right in their nice red uniforms and to the left is la légion du midi (385 men) in their brown uniforms. These are Foundry figures that were painted around 2 years ago. A glance to the left or right clearly shows some improvement in my painting technique. 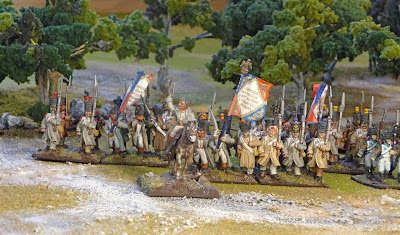 Next are the 4e, 5e and 6e battalions (1370 men) of the 66e régiment de ligne. I have to make a confession here, about half of the figures were painted by someone named Patrick. I was quite interested in improving my technique so I bought these figures on ebay. After discussion with Patrick and looking at his figures, I decided to change to using a white primer and very thinned paints. By looking closely at the figures you can see the difference between the master and the pupil, but this purchase was the best I have made, since I started painting figures. 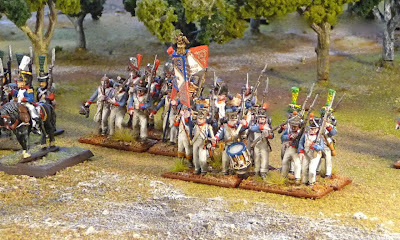 They are Front Rank, aside from 2 Voltiguers and 2 Grenadiers in the second row which are Perry plastics. The colonel is also Front Rank and was painted by myself about a year ago. Here are 4e and 6e battalions of the 82e ligne. 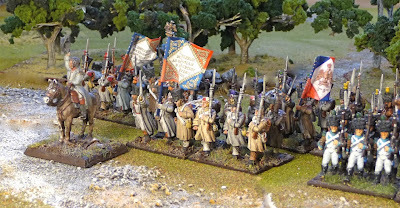 These are Victrix figures and are the most recent off my painting table. 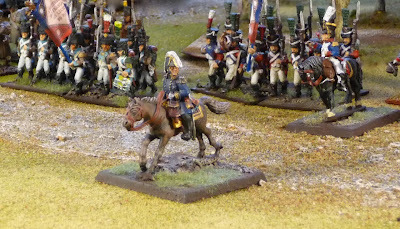 The command stand with the eagle show a Perry plastic drummer and flag bearer. I will change them out when I get another box of Victrix. The mounted colonel du régiment is a Foundry figure. 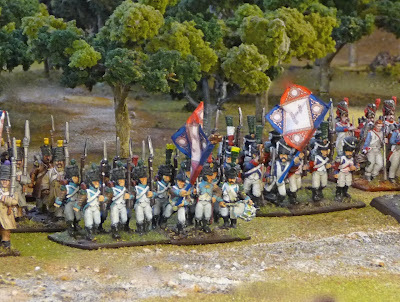 Finally, the 4e, 5e and 6e battalions of the 26e ligne, also Victrix figures. Nice stuff John! I love seeing Napoleonics Divisions; Naps always looks better 'en masse'. It's interesting to see your progress, 2 years makes quite a difference! And those grass tufts really add 'personnality' to bases, don't they? I like the look as well, I am actually almost finished the whole 6th corps, hopefully within a month. 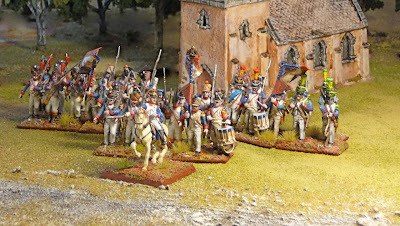 I just am finishing up 2x 4 figure unit of chasseurs and hussars. They were a breeze to do in comparison to the Victrix. The german grass is nice. The washes are quick, but I still need to work on the light colours. Very impressive - your Victrix figures turned out very nicely. Like the results you've got with your Victrix and note you've mixed figures in with the Perrys.. Thats encouraging as I was hesitant because of the size differences - the Victrix are huuuge! That said, they are wonderfully detailed figures and the variations in poses are endless - not to mention a Brigade in a box! I've just finished my Perry's and am about the embark on my four battalions of Victrix. They really do not look that different, but I plan to move these figures to another unit when I get another box of Victrix. Good luck with the Victrix, that is a lot of glueing!! Watcorp Designs: 28mm Wargaming Modurail - 3D Printable Future Monorail Kickstarter Ending Today! Beach boards 5 - rocks part 2 - OMG! WOW!